Posted on May 12, 2017 by Matthew Leib. This entry was posted in Spotlight, Staff Stories and tagged Coaches' Corner, Spotlight, staff story, UW Athletics. Bookmark the permalink. 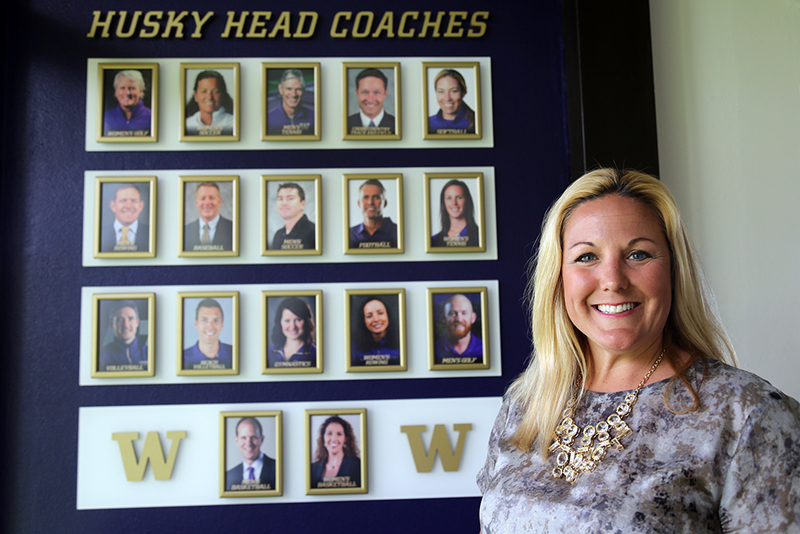 One of the first things Jennifer Cohen did on becoming athletic director of the University of Washington last May was shelve the hardware. The UW’s previous athletic director, Scott Woodward, had kept an array of championship rings displayed on a wall over a conference table in his office in Graves Hall. In making the space her own, Cohen decided to hang in their place the portraits of the athletic program’s 17 head coaches, arranged chronologically in order of years spent serving the University. The small, but deliberate gesture is indicative of a farther-reaching, holistic program philosophy espoused by Cohen and coaches alike. An end goal is to win championships, to be sure, but only by way of building a championship culture that emphasizes process, perspective, and the whole individual. It’s a win-win scenario of a different sort: develop the whole student-athlete from all angles of their lives and that is likely to translate to a more competitive program. Cohen believes this more direct emphasis on principles and process over the prize of postseason play causes championship culture to emerge organically, set deeply, and ultimately usher in a more powerful impact—not just in the athletic arena, but in the wider world as well. And the rewards have come. On her first day as athletic director after being promoted from interim status, Cohen watched from her office as UW Women’s Golf defeated Stanford in Eugene, Oregon, to clinch the national championship. More victories have followed, both on field and off. Sport, for all the commotion it generates, is not the sum total of Cohen’s work. As athletic director, she’ll often speak of her work in academic terms. Each department, in turn, has its own educational objectives, which are served by the athletics component, not the other way around. She says she’s particularly proud of the fact that, for the past two quarters, 18 of 22 teams have registered GPAs above 3.0. It’s a culture of pride in and respect for self she sees as extending well beyond the life of the student athlete. It’s about driving toward a comprehensive approach to wellness wherever you look. While she admits it can be difficult to compartmentalize life, Cohen says that to be “the best,” one should find balance between caring for relationships and friendships, while also taking time to care for oneself by way of personal fitness, nutrition, sleep, and mindfulness. Will everyone achieve success in all of these areas? No. But Cohen says there is only failure if you do not make the effort to try. Cohen admits she is not a born winner. “I failed all the time growing up—I was always second place; I was an average student; I was an average athlete; I was average at everything. I had to work so hard to be great and I still will always still have to work harder because nothing comes easy for me,” she says. Instead, she says her present positive, winning mindset was earned—both through hard work and exposure to the culture and coaches of UW Athletics down through the years. Growing up in Tacoma, Cohen would often attend Husky football games with her family. As a fifth grader, she wrote a letter to UW coaching legend Don James declaring her intention to succeed him and become the first female football coach in college athletics. He replied encouragingly—tempering the long-shot odds of landing the gig by suggesting she instead get involved in sports’ business side. After studying as an undergraduate at San Diego State University and earning her master’s degree in physical education with an emphasis in sports administration from Pacific Lutheran University, Cohen got a first taste of that dream with intercollegiate athletics administration stints at Pacific Lutheran, the University of Puget Sound, and Texas Tech University before joining the UW in 1998. Almost two decades later, the nostalgic feeling she gets every time she walks into Husky Stadium has hardly subsided. Whether it’s coaches in the athletic program, student athletes in the wider campus community, or fans in the stadium, it’s the people who make the place and charge it with their own enduring values. When the rigors of her role as AD threaten to upset that that balance, Cohen says she finds solace in being active, working out with friends or carving time out for her own routine. A favorite stop is the Blaine Street Steps, climbing two blocks through Seattle’s North Capitol Hill neighborhood. In past interviews, Cohen has described working at the UW as a “childhood dream come true.” If Cohen is living the dream, she’s not ready to take it easy. Whether it’s in the rankings or on the Blaine Street Steps, Jennifer Cohen would rather keep climbing. 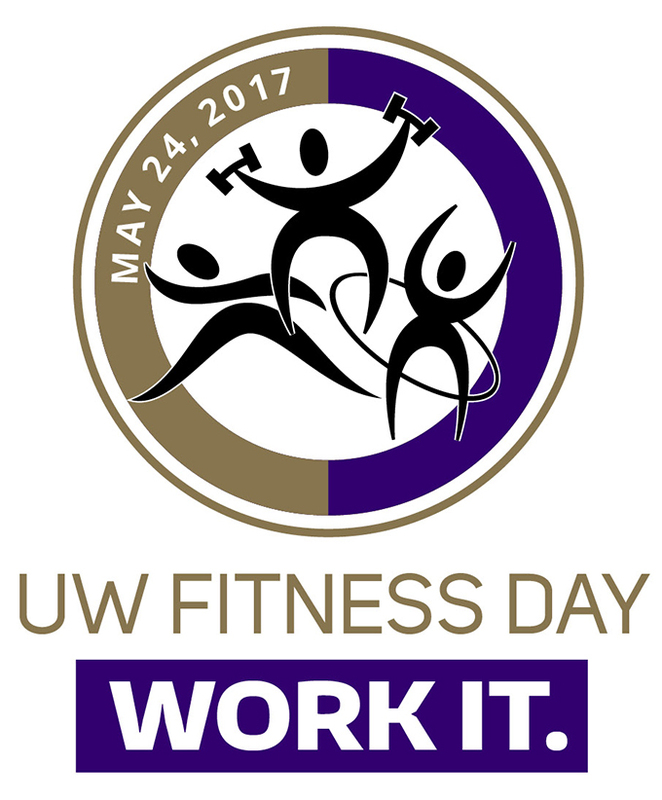 Join Jennifer and 39 other coaches from UW Athletics, UW Recreation, and our fitness discount partners on the field at Husky Stadium for UW Fitness Day on May 24. Register here. I love Jennifer Cohen. She is truly a hero for all of us. Thank you Jennifer!